IDENTIFICATION: Yellowish, aphid-like insects but smaller; identified by the pea-size galls they form to live and reproduce in. BIOLOGY AND LIFECYCLE: Incomplete metamorphosis. Male and female adults are wingless until the fall of the year, then appear with wings. They mate and deposit eggs to overwinter. Like aphids, they also give birth early in the season. 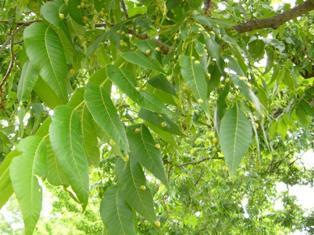 HABITAT: Grape leaves and roots, pecan and other tree leaves. FEEDING HABITS: Inject an agent into leaves to form galls to live in while they feed on the gall walls. FEEDING HABITS: In the West very damaging to European variety of grapes. We have had no complaints of them on grapes in Texas. They do get on pecan leaves and are known to bother native varieties, but we are now beginning to find a few on some improved varieties. 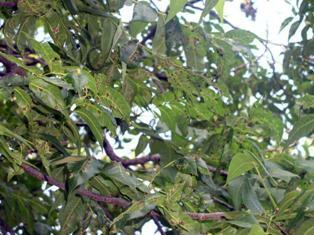 NATURAL CONTROL: Casebearer moth larvae and a weevil larvae are often found living in the galls. They feed on the gall wall, which may disturb the very small phylloxera enough to upset their life cycles. We can't pinpoint any specific insects as predators, but every insect has something to keep it in balance. Ladybugs and green lacewings probably help. ORGANIC CONTROL: Horticultural oil and citrus oil products could help, but we really don't recommend any treatment because of damage to beneficial insects. INSIGHT: Some growers try to control phylloxera with horticultural oil. We don't think it does much good and we know that it kills beneficials, so it's probably a waste of money. Q: Any suggestions for organic control of the Phylloxera grape pest infestation - similar to a small aphid - forms many 'galls' on grape leaves, slowly starves grapevine. A: Sure. Cornmeal on the soil, cedar mulch on top of that, foliar feeding with aerated compost tea, and using the entire natural way program to develop soil health and a strong natural resistance. Balancing the chemistry in the soil is also an important part of the solution.